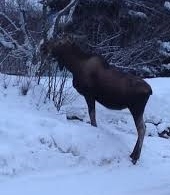 Traditionally, moose have also been taken outside the rutting season, especially in the winter. At this time, moose tend to be scattered. If the snow is fresh and powdery, a hunter can move silently through the forest and thickets. But if the snow is drifted or develops a crust, every footstep makes a noise that alerts the moose. Making matters worse, even slight sounds carry over surprisingly long distances on windless days with temperatures far below zero—as often happens during the northern winter. 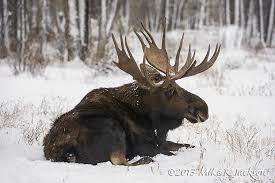 Moose have excellent hearing, so the best chance of approaching one in the winter is during storms when gale winds and gusts cover the sound of crunching snow. Luckily, temperatures tend to be warmer during storms, so although hunting in these conditions can be very uncomfortable, it’s not as life threatening as when the temperatures sink to minus thirty or colder. When the snow is really deep—up to a moose’s belly—these animals have a very hard time moving around. Also if the snow is deep and crusted, the heavy-bodied moose will punch through the icy crust, cutting its legs as the animal walks, making travel extremely difficult. If the crust is hard and strong enough, wolves can walk on top, giving them a lethal advantage over moose. Mired in the snow, a moose cannot escape by running away and has difficulty defending itself. Human hunters on snowshoes can also stay near the top of deep or crusted snow while the moose are forced to wallow slowly along. Under these conditions, a moose is virtually trapped in a small area of its feeding trails, making it extremely vulnerable. When the snow is not so deep, moose can move far more quickly and easily. The practiced hunter knows that if moose tracks consistently lead in a single direction, the animal may be heading somewhere else and will be very hard to catch. If a moose is feeding in one area its tracks will wander in multiple directions. This is good news for the hunter, because he may have a chance to get close to the animal. Now the difficulty is to find which tracks are the freshest and which direction they lead. A hunter always wants to know how old the tracks are—how long ago did the moose make them? Would it be possible to catch up or is the animal long gone? A track made within the hour is soft—as soft as the surrounding snow. The hunter riding on a dog sled or snow machine might simply drag his boot through the track. If the track is fresh, he feels almost nothing. If it’s older, he feels two distinct thumps as his boot hits both sides of the track. In cold weather—especially if it’s far below zero—the inner walls of an animal’s track will recrystallize and develop a crust within a few hours. This starts first around the top and happens later at the bottom. If the track was made the night before it will be harder still. The colder the temperatures, the more quickly a crust forms on the inside of tracks. A hunter on foot pushes his boot or a mittened hand down into the tracks, feeling the crust or testing how much pressure it takes to break through. The harder the crust, the older the track. In below zero weather, a track made two days ago or earlier will be very hard. Another sign the hunter looks for is moose droppings. When they’re fresh, the color is dark brown and they’re soft. In freezing temperatures, the pellets quickly harden and turn lighter. Other signs are willow branches that have been freshly broken by browsing moose, the white wood showing conspicuously against the darker background of the thicket. Often this is accompanied by a scramble of tracks and patches of gouged-out snow where the moose has pawed down looking for edible vegetation under the snow. Moose rest or sleep in snow beds, often straight downwind from their tracks. They do this to catch a warning scent from any predator that is following their trail. At other times, a moose that hears a suspicious sound or spots something unusual will intentionally move downwind to test the scent. A moose can recognize the drifting smell of a wolf or human, even at a considerable distance. When a hunter is following fresh moose tracks in the snow, he knows that the animal could have bedded downwind so it would pick up his scent. For this reason he leaves the trail at intervals, walks straight downwind, then makes a wide loop and heads back upwind—always watching the underbrush for the dark shape of his prey. Again and again, he makes these downwind loops and comes back upwind until he finds tracks leading to where the moose is bedded. If luck is with him and the moose never catches his scent, he may catch it unaware.